China considers Taiwan its sovereign territory. It calls incursions by US warships into the Taiwan Strait provocative – the 110 mile-wide waterway separating Taiwan from the mainland. It’s confronted by Washington because of its growing political, economic and military power. The US tolerates no challengers to its aim for global dominance. Trade war may be prelude to something much more serious. China must “safeguard its core interests on Taiwan and the South China Sea, strike counterblows to provocations without hesitation” – short of letting “countermeasures (become) a global contest with the US,” said GT. In his remarks days earlier, Xi warned about “repeated challenges” to China’s sovereignty over Taiwan, calling them extremely dangerous, risking military confrontation. His remarks were directed against the Trump regime. 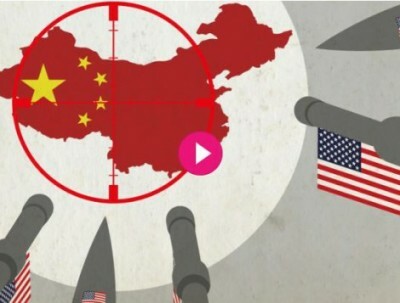 Military analyst Zhou Chenming expects the US to continue conducting provocative incursions near Chinese waters – on the pretext of freedom of navigation exercises. Xi also spoke out against Taiwan’s independence-leaning Democratic Progressive Party – in power since 2016. Bilateral relations deteriorated since then, including over US arms sales to the government. China’s Foreign Minister Wang Yi accused “non-regional countries” of provocations near the nation’s waters, saying they “have been showing off their force” referring to US actions. In January, Defense News.com said “(t)he Pentagon is planning for war with China and Russia.” Washington has adversarial relations with both countries – along with Iran and other sovereign independent states. War between nuclear powers would be potentially devastating, humanity’s greatest threat. Neither Russia or China would initiate it. Would bipartisan hardliners in Washington risk armageddon to achieve their aim for unchallenged global dominance?